Sir Wrangler is a model Appaloosa -- literally. In 1998, Breyer created a model in "Wrangler's" colorful likeness to celebrate the Appaloosa's diversity. The stallion and his owners, Jan and Joe Bard of Maple Valley, Washington, have spent more than a quarter century promoting the breed. The Bards purchased Wrangler (Prince's Wrangler x Royal Ann) as a long yearling from Jess and Carolyn Moreno of Springfield, Oregon, in 1979. They took their colt home, showed him, and created a breeding program around him and his offspring. Wrangler also became part of the family. The stallion showed throughout Washington, Oregon and California in the late 1980s, becoming the Northwest's first Club champion. 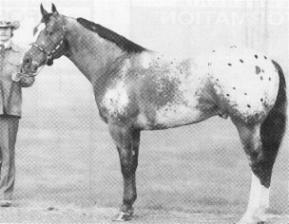 He earned registers of merit in halter and western pleasure and also collected points in western riding and hunter under saddle. He's produced 204 registered foals, including 49 performance point earners and 27 halter point earners. Combined, they've collected 2,084 performance points, 349.5 halter points, 61 registers of merit, eight superior event titles, three superior event certificates, 14 bronze medallions, one silver medallion and one gold medallion. Wrangler has produced four Club champions and five versatility champions. His foals have excelled as youth and non-pro horses at the regional, National and World levels. Some of his notable offspring include Sirvived, Sirafin, Canute, Sirpent, Echo's Wrangler, Dude To Wrangler, Spank My Wranglers and Wrangler's Bear. Wrangler also produced one race starter, Sir Rocco, who became a stakes placer. The stallion still lives with the Bards and continues to produce a foal crop each year. Retired from working, Wrangler enjoys his days in his own 2-acre pasture. Copyright © 2004 Appaloosa Horse Club. All rights reserved.